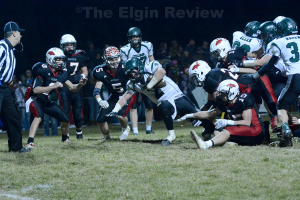 ELGIN — Down by two scores in the second half, Clearwater/Orchard rallied for a 42 to 28 victory over the Wolfpack Wednesday night. The loss, in the quarter-final round of the D1 State Football Playoffs, ended the Wolfpack’s season. “Kids played hard tonight. It was a hard-hitting, physical game. 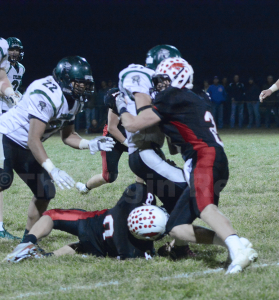 We just didn’t have the breaks go our way,” Coach Randy Eisenhauer said about the loss. He said mental mistakes, at crucial times, may have been a deciding factor in the game’s outcome. The Wolfpack led 22 to 18 late in the third quarter when an incomplete pass on a EPPJ fake punt gave the Cyclones a short field to work with. Three plays and 15 yards later, Clearwater/Orchard was in the end zone as Blake Kester scored from eight yards out as they took a 26 to 22 lead with 11:33 to go in the fourth quarter. EPPJ fought back on their next possession. A 28-yard run by Andrew Fangman gave the Wolfpack a first down on the Cyclones’ 24-yard line. A quarterback sack, followed by a holding penalty on a reverse, pushed the ball back to near midfield. Seth Schumacher completed two passes, one to Kyle Kallhoff and the other to Fangman, but the Wolfpack turned the ball over on downs. The Cyclones avoided disaster by recovering a fumble on their second play of the ensuing drive. On the third play, Zach Martin burned the Wolfpack secondary with a 57-yard pass to 6’8” Andy Kerkman who raced into the end zone. The two-point conversion made the score 34 to 22 with 6:10 left in the game. EPPJ answered right back with a 55-yard touchdown drive. Schumacher connected with senior wideout Dylan Behnk for 35 yards down to the 10-yard line. Two plays later Schumacher found Fangman for the touchdown, cutting the Cyclones lead to 34 to 28. The Cyclones recovered an onside kick, then used the legs of Kester and Riley Snider to move the ball down the field and eat precious time off the clock. Kester’s 11-yard touchdown run and a successful two-point conversion with 1:56 left in the game made the score 42 to 28. EPPJ appeared to score a touchdown with 19 seconds left, but an inadvertent whistle by an official nullified the play. An interception as time was running out sealed the Cyclones’ upset victory. Earlier in the game the Wolfpack appeared to be the better team. They marched 55 yards with the game’s opening possession to take the early lead. Fangman scored the first of his three touchdowns, on a one-yard run, and Schumacher added the two-point conversion for an 8 to 0 lead. 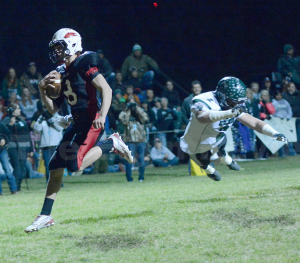 The Cyclones answered right back with a 25-yard Martin to Kerkman touchdown pass. Clearwater/Orchard then took a 12 to 8 lead on a Martin to Kester touchdown pass. The Wolfpack regained the lead midway through the second quarter when a blown coverage by the Cyclones left Kyle Kallhoff all alone down the middle of the field for a 51-yard touchdown pass. Fangman’s two-point conversion made the score 16 to 12 with 6:35 to go before halftime. On their first possession of the second half, the Wolfpack took advantage of a short field to increase their lead. Starting on the Cyclones’ 29-yard line, EPPJ fed the ball to Fangman on five of six plays. His last carry, a five-yard run into the end zone made the score 22 to 12. The Cyclones answered back on their ensuing possession. Capitalizing on a controversial pass interference call, they drove 69 yards in 12 plays as Kester scored on an eight-yard line. For the game, the Wolfpack had 427 total yards, the Cyclones had 323. Individually, Fangman led all rushers with 148 yards on 36 carries. Schumacher completed 17 of 27 passes for 220 yards. Kallhoff led Wolfpack receivers with 107 yards on seven catches. On defense, the Wolfpack were led by Scott Moser and Chad Bode each with 10 tackles, Schumacher and Austin Meis both had nine. 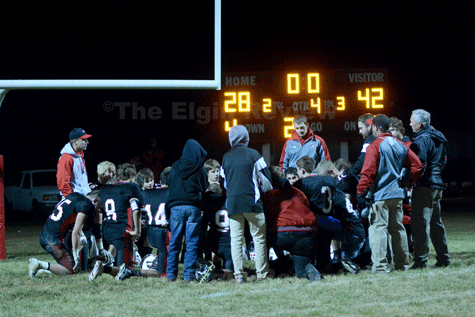 “This game right here didn’t represent the whole season …The kids really battled the whole year,” Eisenhauer said. The loss ended the Wolfpack’s season with a 9-3 record.